Facebook and Instagram may not be taking home statues, but the social network and its photo- and video-sharing network will play major roles during the 72nd annual Golden Globes awards Sunday night. The Facebook Lounge, a standalone booth on the red carpet where public figures can record video messages answering fans questions, which will then appear on the Facebook pages for the Golden Globes, broadcaster NBC and that network’s Today. Golden Globes winners will be photographed backstage by fashion photographer Ellen von Unwerth, and those images will immediately be shared to the Golden Globes Instagram account, with some being incorporated into NBC’s broadcast. We’re excited to say that this is the most social Golden Globes to date by partnering with Facebook and Instagram. We know this will be an excellent opportunity for talent to engage directly with their fans via video and really capture what it feels like to be there on the red carpet with the nominees. HFPA is also partnering with Instagram to create portraits backstage with renowned photographer Ellen von Unwerth. Readers: Will you interact on Facebook and Instagram during the Golden Globes broadcast Sunday night? 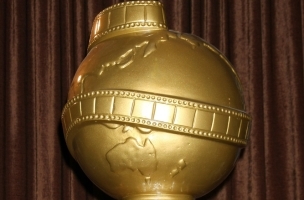 Image of Golden Globe statue courtesy of Shutterstock.